Use any solution – deliver any content. MediaDropBox is a easy to use platform to manage the flow of media files and metadata to one or several destinations or applications. With MediaDropBox it is simple to let freelance photographers and other suppliers of media files and metadata, deliver objects to systems of your choice in an controlled and secure way. Use MediaDropBox with your mobile unit or with other devices of your choice. Users can create jobs or be assigned to jobs created by other users or external planning tools. Metadata is automatically applied to objects before delivery depending on chosen job. For user convenience a plugin to PhotoMechanic is available. With the plugin installed users can link job metadata to images or videos easily when uploading them from PhotoMechanic. MediaDropBox includes a FTP server for use with any ftp capable application or device. Each user automatically is assigned a ftp account that can be used for delivering objects linked to job and its metadata. Integrate other applications and systems with MediaDropBox by using the built-in REST API. Fetch information, upload media, configure the system and perform all tasks, even administrative ones such as adding users, via the HTTP-JSON protocol. Example, let external planning tools create jobs in MediaDropBox, or write your own plugins. MediaDropBox can be deployed in both private an public cloud environments. Systems is final endpoint for media files. Register your internal or external systems in MediaDropBox and connect them to one or several destinations. 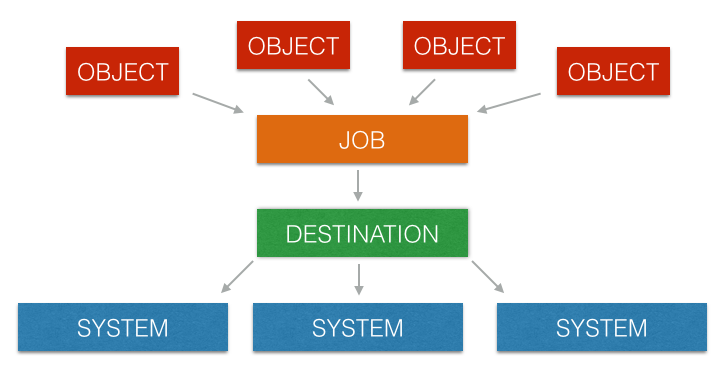 Destinations is a logical delivery point for objects that can route objects to one or several systems. Job is an logical collection of metadata and linked to a destination. Each object is linked to a job and its metadata. An object can be Video, images or other media types. With MediaDropBox GUI and FTP server placed on a public server external suppliers can deliver media files easily. Portal server installed on the private network delivers files, holds information about users and their jobs and permissions.